SENG (Supporting Emotional Needs of the Gifted) emphasizes the importance of parent support groups. SENG Model Parent Groups (SMPGs) bring together 10 to 20 interested parents of gifted and talented children to discuss such topics as motivation, discipline, stress management, and peer relationships. The co-facilitators of the group, though they are knowledgeable about parenting and about educating gifted/talented children, do not attempt to give expert advice to families. Instead their facilitation provides a non-judgmental and nurturing atmosphere. The parents of the high-ability children are themselves a rich resource of information, and they are able to get fresh ideas from other parents and from A Parent's Guide to Gifted Children, the book around which the sessions are organized. The groups meet weekly for 8-10 weeks. In November 2012, AGATE trained new facilitators of "SENG-model parent groups". 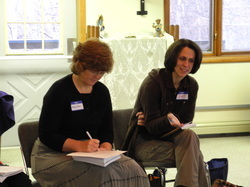 We now have trained facilitators in Great Falls, Hamilton, Columbia Falls, and Bozeman. If you'll like to join or request a SENG-model parent group in your area, contact one of the trained facilitators. Why Become a Facilitator of SENG Model Parent Groups? As a facilitator you can help parents understand and develop skills for nurturing the emotional development of their gifted children. Towns with strong support groups for parents of gifted students tend to foster strong gifted programs. When parents (and teachers) better understand how to copy with the "quirks" of gifted kids, life can be smoother and easier for everyone. Flathead Valley residents participated in a group led by Jenny Jarvis & Mary Ellen Getts in Spring 2013.